I bring you warm greetings from the National Council of Churches in the Philippines. The NCCP has been asked to share on how the churches in the Philippines and the NCCP is responding to the needs of our time in the context of diakonia and development. I hope my sharing will help to inspire each one of us in this forum. While waiting in the boarding area of the Ninoy Aquino International Airport for our flight from Manila to Abu Dhabi, I had a look at the groups of passengers, many of them are holding envelopes with their names and employment agencies boldly written on it. I assume those envelopes conceal their travel requirements. In our seat, I overheard a woman, which I assumed hails from the same region as mine in Northern Philippines, talking to her husband and children in our local dialect. She said (which I’ll paraphrase in English) to her husband, “I know it’s not easy, but I have to sacrifice for our children’s future, for us to survive. She is just one of the more than 4,000 Filipinos leaving the country every day, hoping for an employment to keep their families survive. Unfortunately, not everyone is lucky enough to find one. The Philippines is recently classified as a middle-income country, but this economic status is yet to be felt by the Filipino masses. The last decade in the life and work of the NCCP has been pronouncedly one of being in solidarity and of service. It is the collective witness of the churches and its associates, amplifying as it were what our churches do. Diakonia in the Philippines is service and proclamation at the same time. Three weeks ago, more than 3,000 national minorities, travelled to the city capital to share their stories of struggle and hope. Yet, NCCP member churches opened their doors, welcomed them and listened to their stories. The HIV crisis in the Philippines put us in the forefront of the fight versus ignorance and stigma, side by side with key affected sectors. Developing a common understanding on the social issues among the churches by providing a platform of “discerning and reasoning together” is crucial in doing our ministries. In our humanitarian response, we understand that we are co-journeyers of the survivors’ rising up from the devastation caused by disasters. For the communities whom we serve and who have become vulnerable to the denial of their dignity, community organizing helps a lot in strengthening hope. Organizing work is our understanding of empowerment. It enables the people to understand the necessity of a more organized response to disasters as it focuses on the common good and divergence on God’s will for all. It paves the way to break the shackles of dependence and the ill effects of a “whatever-we-can-get” attitude spawned by power which patronizes. More importantly, it promotes the idea that the struggle for human dignity and access to social services is a right that needs to be exercised especially when these are denied deliberately. For us who render service, it hones our understanding of Christian hope and loving service. It reminds us that in doing service, solidarity means taking the side of the vulnerable, excluded and marginalized. The persistent advocacy of the NCCP for the preservation of human rights and civil liberties, stem from our understanding of the vision of “abundant life” (John 10.10). It is both a vision and a hope that can be lived out in concrete forms until its final fulfillment. In the Philippines, there has been a surge of rhetoric against those killed by the drug war, but our Christian witness has led NCCP to support the victims and their families, which sees the substance abuse as a sickness to be healed rather than killed. Most recently, the church people accompanied the delegation from the Philippines to the United Nations annual Universal Periodic Review. 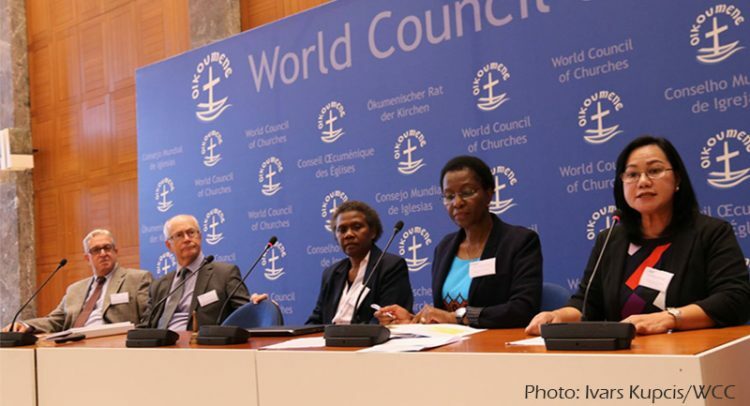 We see the important role of the churches and the ecumenical network in amplifying the voices of the most vulnerable in all levels – from local to global. These are the concrete expressions of the NCCP’s diaconal ministry, all with components of education, advocacy and service. Through the relationship of NCCP with its 10 member churches and with its local and international partners, diakonia is extended to those who need it the most. In going about our apostolate, the NCCP maintains one more important consideration – partnership work. Churches do have their own way of responding to human needs. But, they too, appreciate the necessity of partnership. Human needs in the present have become more widespread and urgent as resources have dwindled. All the more must the theme of sharing be underscored constantly as God’s providence is to be shared by all. The growing recognition on the role of faith-based organizations on humanitarian and development work has inspired NCCP, and the ACT Philippines Forum, to embark on initiating the formation of the Philippines FBO Forum which seeks to create a consolidated and stronger voice, aiming to influence its constituencies and the relevant actors to do the work better. It intends to develop more profound and purposive partnership contributing largely to the localization agenda within the humanitarian field. How then can we strengthen our response? We will seek coordination, cooperation, and complementation of work, bringing common advocacies from the people wherever possible. We recognize the different roles of the whole ecumenical family in striving for sustainable development and resiliency, bridging the connection between the high-level advocacies from what’s transpiring from the ground. Finally, we will be steadfast in our solidarity with the rest. We will take part in encouraging the marginalized and vulnerable communities realize their potential. We will endeavor to be platform upon which the weak can speak and be heard, and be advocates of their cause. More importantly, our endeavor of ecumenical diakonia will never go astray for as long as we put people at the center – for they are the people we pledged to serve.